It’s often the case when working on a new book (as we are currently for Montsant) that you come across a winery that is incredibly surprising. It doesn’t always happen, but when it does it makes you happy you took the time to visit each and every cellar in a region. The was the case with Mas de les Vinyes. It would have been very easy not to visit it. Located within the boundaries of Cabacés, it’s nowhere near the village. It is in fact the only winery still in existence in this small village that is now known much more for its olive oil (insanely delicious btw). Toss in this the fact that the visit ended up being in the middle of January (a time of the year known for seasonal hospitality in the comarca of Priorat) and the “Thank you, no” option would seem even easier. But then I went. 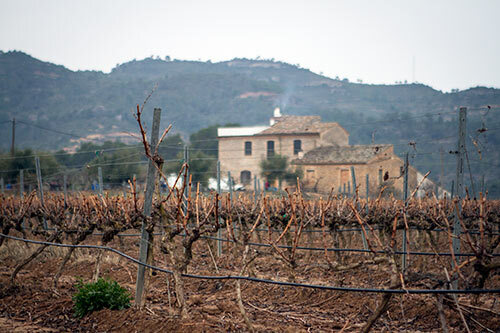 The masia and the lands around it are pretty normal for the area except that the Borràs family grow a more mixed assortment of fruits trees alongside their vines. Son, Josep is a very friendly guy and happy to show anyone who visits around. In the summer he’s hoping to do more food oriented events and other things to bring people to the masia. The cellar is a mix of large stainless tanks and some barrels for aging. So, it’s all pretty much par for the course in the region. Then I tasted the bottle samples that Josep gave me. Overall, they’re excellent and priced very well. Their Racó d’Atan Selecció 2003 is epic, on the level with some of the most elegant Bordeaux wines. And all of this was surprising. Not because finding good wines in DO Montsant is difficult, but because it makes you wonder as to why there isn’t more wine coming out of Cabacés if Mas de les Vinyes is proof of what you can make there? Always surprises. For the full profile and tasting notes, read the book.